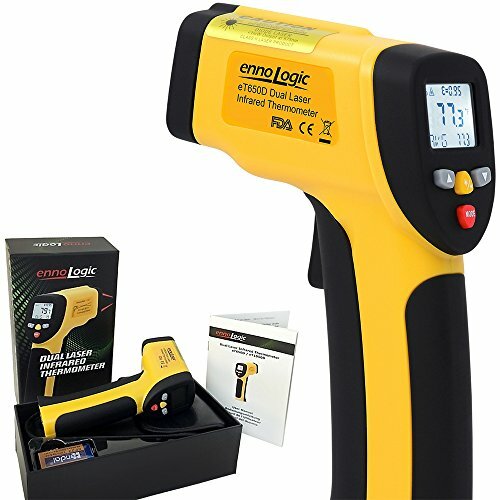 The eT650D from ennoLogic is a noncontact precision infrared thermometer that allows you to measure the temperature of an object from a distance by sensing its radiated infrared energy. It is a feature-packed instrument with countless home and industrial uses that include cooking (pizza, grilling, candy and chocolate making, tea, beer and wine home brewing), food safety, refrigeration, forging and metalworking, soap making, automotive, A/C, HVAC, pool, and even animals (reptiles, chickens). NOT designed for body temperature measurement or medical use. Compliant with FDA and FCC regulations. NIST-traceable calibration verification certificate included. ACCURACY AND DURABILITY YOU CAN RELY ON FOR YEARS TO COME: Our temp gun won't give you wildly inaccurate readings, burn up batteries, or die in the first week. The ennoLogic temperature gun is a professional instrument that will give you accurate readings for years, whether you're relying on it for food safety inspections of freezers and hot food stations, HVAC work, BBQ, cooking, or home improvement projects. Not for medical use. IMPRESS YOUR FRIENDS WITH THE PERFECT PIZZA: Adjustable emissivity gives you the needed accuracy for your wood-fired or brick pizza oven. Want your pizza stone at 485°F? Easy. Or use a Himalayan Salt Block at 500°F to grill that salmon indoors - INSTANT GRILL MASTER! Whenever you pull the ennoLogic gun out of its holster to bring your new grill or pizza oven to the optimum temperature, be prepared to answer questions from your friends about your fancy new tool! OUR CUSTOMERS RAVE ABOUT THE 1000'S OF DOLLARS THEY SAVE ON HOME AND CAR REPAIRS with our laser thermometer. Find exactly where insulation is missing, or hot and cold air leaks. Check the output of A/C units and save replacing a condenser by fixing a blower motor. You'll LOVE how easily you can measure heat loss in windows and doorways, or monitor wood stove or water heater temperatures. Check your cars cooling system, catalytic converter, brakes, and tires. OWN THE ULTIMATE INSTANT-READ COOKING THERMOMETER: Safely test hot foods, reheated baby food, water baths, and frying oils in seconds without spills, burns or mess. Want to make frying healthier? Use the SCAN mode to track temperature variations of your oil with high accuracy, and set the HIGH ALARM to below the smoke point. Or scan your oven walls and range top to find out how hot they really are. Take the guesswork out of your cooking and baking with an accurate tool you can rely on. PROFESSIONAL FEATURE-LOADED IR THERMOMETER AT A FRACTION OF THE PRICE: Scan & Hold. Hi and Lo Alarm. Min, Max, and Average display. Dual lasers and adjustable emissivity for increased accuracy. Even has hands free mode! Large display with bright backlight is easy to read in any lighting. NIST TRACEABLE CALIBRATION CERTIFICATE INCLUDED. But don't be fooled by look-alikes - only ennoLogic units get tested and packed in the USA, comply with FDA and FCC, and are backed by our 10 YEAR WARRANTY. If you have any questions about this product by ennoLogic, contact us by completing and submitting the form below. If you are looking for a specif part number, please include it with your message.